This Ride On Trowel Rental – Multiquip JWN24HTCSL , is available for rent in Rochester NY, Ithaca NY and the entire Western New York region from the Duke Company. 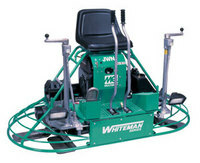 A highly versatile, six foot ride-on trowel, this machine can handle jobs up to 6,000 square feet. Its light weight, is perfectly suited for buildings with multiple floors. It is powered by a Honda GX670 gasoline engine.